The UTSA Urban Future Lab and Southside First EDC are working on ways to revitalize the Quintana Road and Mission San Jose communities. (July 26, 2018) -- In collaboration with Southside First Economic Development Council (SFEDC). The University of Texas at San Antonio (UTSA) Urban Future Lab – an interdisciplinary think-and-do-tank and research laboratory founded by UTSA Assistant Professor Antonio Petrov – is undertaking a pilot program on the Southside of San Antonio to foster social mobility and placemaking in the Mission San Jose and Quintana Road communities. SFEDC was established in late 2016 by the South San Antonio Chamber of Commerce to catalyze revitalization efforts in San Antonio. Since that time, it has focused on growing the economy using a three-pronged approach. It (1) develops programs and facilitates partnerships to connect economic growth resources to Southside communities; (2) energizes and empowers business, neighborhoods and schools through economic events, workshops and marketing outreach; and (3) provides economic data, identifies indicators and advocates for solutions to support revitalization efforts for Southside business corridors and neighborhoods. 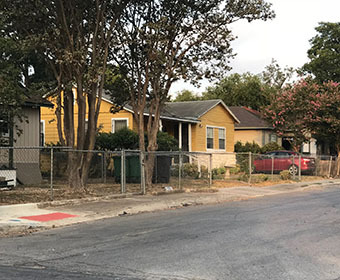 While its community-based development approach has made a positive impact, equity, mobility and income segregation studies continue to reflect a large disparity in Southside San Antonio. In the Mission San Jose community, which has a population of 5,630, the median household income is $27,500. In the Quintana community, which has a population of 11,780, one third live below the poverty level and the median income is $25,636. “San Antonio is a fast-growing city and, as the city faces north, something is getting left out” said Andrew Anguiano, SFEDC executive director. “In the south, for example, you have major economic assets like Port of San Antonio and you have a neighborhood next door – Quintana – that has a household income of $25K right next to it. The question is, why are these economic assets not activating the environment?”. Anguiano called on UTSA researchers to help assess the challenge. Petrov, along with visiting postdoctoral research fellows and UTSA College of Architecture, Construction and Planning students, has started addressing questions of inequity through community dialogues. In these dialogues, The Urban Future Lab and Southside First EDC are distinguishing between myths and solvable problems, while tapping into the communities’ existing entrepreneurial spirit. A hybrid civic engagement approach is central to the effort. The Urban Future Lab is focusing on the physical and digital realms to gather increasingly personalized data from residents of the pilot communities to address the issues of digital, human and geographic inequity. “Antonio Petrov is guiding us to re-evaluate the way we think about things. He is changing the mindset,” said Anguiano. As founder of the Urban Future Lab, Petrov employs a “no-box” approach in addressing imminent issues affecting San Antonio such as infrastructure, housing, water, transportation, data analysis, education and equity. The researchers are taking a project-oriented and pragmatic approach in imaging and implementing initiatives for the future. Collaboration with city entities is integral to the partners’ mission to develop solutions for Southside residents and businesses. The pilot program led by UTSA and Southside First EDC will produce a community-based strategy that outlines assets and resources to advance economic revitalization and community development. The partners will chart a path that translates the communities’ collective ambitions and visions into values, responsibilities, duties and aspirations to develop the mechanisms necessary to define a future trajectory. Learn more about the UTSA College of Architecture, Construction and Planning.